If you have never seen a performance of this amazing organization then you are in for a delightful treat. Cirque du Soleil which started in Canada almost 60 years ago, has become the most incredible force in the spectacular circus world. With many touring shows all around the world and more resident shows in Las Vegas, they are in a class by themselves. Forget about a story line. 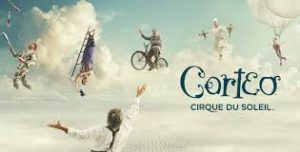 It is a circus, not a story; albeit this one refers to Corteo which means Procession in Italian, and is about a clown viewing his own life history and funeral. It is a conglomeration of overlapping acts competing for your attention. What it does offer is incredible staging, incredible props, costumes that are worthy of the finest opera house, music that is scored to highlight every movement, and choreography that is both subtle and exciting at the same time. But, beneath it all this is a circus full of acrobats, clowns and other performers. There are no second-stringers in Corteo. These ladies and gentlemen are all world class athletes and performers. Five of the lead performers are from Europe and two are from South America; and everybody works well with everyone else. They even have two little people who steal the limelight when they are on stage. I could go on and on raving about Cirque du Soleil, but you really have to experience it to understand it. Each of their shows is different. Corteo has been revamped since it’s show here 12 years ago. But, it is still full of acts that will make you want to occasionally gasp at what they do, and laugh a lot as well. It’s been a few years since this one has been staged around Atlanta, and what a treat to see it once again. If you really enjoyed seeing Sister Mary Jo toss out that first pitch in Chicago; then you’re sure to enjoy these five Little Sisters of Hoboken. When this work of art by Dan Goggin hit the boards in NYC in 1985, it enjoyed a run of more than 3,600 performances; and has been revised several times, and also done as a TV show and a film. The Sisters had a serious problem. More than fifty of their order had died from food poisoning in some soup made by Sister Julia. They ran short of money to bury all of them, and four were being contained in their refrigerator. So what could they do, other than maybe raise some money by putting on a cabaret act in a local school? Reverend Mother Mary Regina (Kelsey South) is the more-or-less director of the group. 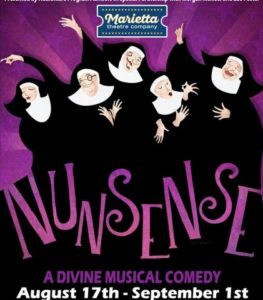 She has to manage the other four, Sister Mary Hubert (Hannah Marie Craton), Sister, and puppeteer, Mary Amnesia (Sophia Decker), Sister Robert Anne (Kate Metroka) from Brooklyn and Sister Mary Leo (Megan Wartell) who is a ballerina. Stephanie Earle directs the show with Shane Simmons working the sound boards. And the theatre’s artistic director, Zac Phelps, put together some groovy choreography. This is quite an enjoyable performance by this new little company. They even have set up some tables, cabaret style, where you can buy four seats and some wine and be right up front. But, every seat has an easy view. 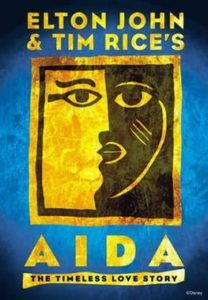 Elton John and Tim Rice’s AIDA is a work developed for Disney by their team and derived from the opera by Guiseppe Verdi. When it opened on Broadway in 2000 it won many awards and had a four year run. The story is about the princess, Aida (India Tyree), a Nubian who is taken prisoner along with many of her people when attacked by the Egyptian army under the command of Radames (Haden Rider) who is heir to the throne of the Pharaoh (Matthew Morris) and engaged for many years to be wed to Amneris (Lauren Hill). You won’t find Nubia on the maps today, but it lies in the southern Nile area twixt Egypt and Sudan. When Aida is brought to Cairo, she comes to meet up one Nubian who figures out who she really is. That’s Mereb (George Roberts) who is sworn to secrecy to prevent her from being quickly disposed of. Prime Minister Zoser (Chistopher Kent), the father of Radames, is scheming to get rid of Pharaoh and get his son on the throne. All hell breaks loose when more Nubians are captured including the Nubian King Amonasro (Brian Jordan, Jr.) and a situation develops between Radames and Aida; and they must figure out what best serves their real interests. As you probably know, this is not one of those tales in which all comes out right in the end. A team of 20 players under the direction of Taylor Buice do a great and highly energetic job, with some fine choreography by Bubba Carr. If you have seen it before, you’ll see it again in a good production. But, if you are there for the first time, know that while it is captivating and draws you in, it is not Cats, Les Miz, or Phantom. The score of more than 20 numbers may not be ones you’ll immediately recall if heard without lyrics. But, it is another good offering from this really good musical theatre in Marietta. Brilliant young scriptwriter, Lauren Gunderson, did a load of research to craft this opus based upon some real characters and happenings back in early 1600’s. For it is a story told by those closely associated with The Bard, such as his friend Richard Burbage (Jeff McKerley), and the not so much of a friend, Ben Johnson (William S. Murphey). 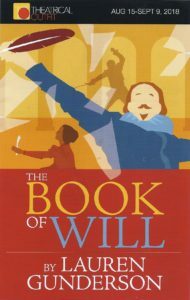 The story is about the passing of William Shakespeare and the problems with getting his works into print. For in those days it was not easy, especially when a tome of his works could be huge and cost more than most folks would earn in a year. Tom Key plays Will’s friend, John Heminges, who is trying to get the Bard’s works collated and put into a complete set. One problem is that a publisher of questionable ethics has some of Will’s works in print, but things start to work out a bit when a working agreement is made with Isaac Jaggard, the son of the publisher. Isaac is played by Kyle Brumley. Heminges joins in with his pal, Henry Condell (Doyle Reynolds) to hook up with Isaac, gather in all the paperwork that can be found, and as one might say, Git ‘er done. The exceptional cast includes Elisa Carlson in 3 roles, Suehyla El-Attar in 3, Paul Hester in 2, Eliana Marianes in 2, and Ryan Vo in 3 more. This large cast of come-and-go characters play out on a set by Isabel and Moriah Curley-Clay, and is directed by David Crowe. It is quite a different type of work which pulls you into the story and makes you think about what the author must have gone through in her research. For we all read some of Shakespeare’s works; but rarely will you encounter somebody who has familiarity with all of them. It makes one think about those olde days at The Globe, when the average Joe stood through the show in the audience and only the peers had seats. And, all the female roles were played by males. The show runs a bit over 2 hours, and there is discounted parking available at the garage just north of the theater. Buy the discount ticket at their concession stand. This play by Jordan Pullian is a re-telling of the story of Hamlet, camped up with some comic book characters that may be distant cousins of Batman and Robin. Something was rotten in the Kingdom of Gothic. The king is dead, a ghost walks the ramparts, and the widowed queen remarries quickly so that the food from the funeral doesn’t go to waste and can be used the next day. Pretty sound planning. Chris Schulz plays the evil Jester, and you’ll get to meet Patrick S.Young as Hamlet, as well as Ham’s alter-ego. Bob Smith is the conniving Puffin and Jessie Kuipers is Ophelia. Horatio is Ali Olhausen and Queen Barbara is Savannah Jones. Parris Sarter plays Riddles, who is a sort of an evil Don Rickles to the hilt. Seven other players round out this large cast for such a small theater. Directed by Founder and Artistic Director,Carolyn Choe, the production is really an exercise in insanity to the utmost degree. Act I may seem a bit long, but the show does keep one’s interest. Good costumes, great fight choreography and plenty of laughs. You’ll recall that famous line when Hamlet says Alas poor Todd, I knew him well. You may have seen the film and/or the play before; but with all the stress going on in our world these days, you could enjoy some laughter. 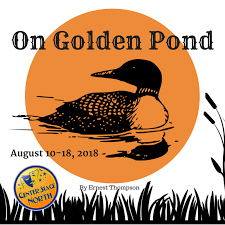 Golden Pond is in a small village in Maine, where Norman and Ethel have a summer home. They spend many days there and pretty much get into the same old stuff every day. Norman (Jim Wilgus) is not that active, other then reading books and fishing. He isn’t much into helping around the house nor in getting into the lifestyles and affairs of others; and that includes his daughter, Chelsea. On the other hand Ethel (Cheryl Baer) is active, tries to get Norman off his buns, even gets into some working around the yard and in the nearby forest. Not only that but she also cooks great cookies. They are empty nesters. But Ethel gets a call from Chelsea (Shannon Lindsay) to say she’s heading in from California and will be bringing her male friend, the dentist Bill (Kevin Renshaw) with her. Chelsea and Bill show up with his son Billy, Jr (Kirk Renshaw). So now the old couple have three house guests. This is quite a treat inasmuch as the son, Billy, is the real son of Kevin Renshaw, and they play off one another so well. The sixth player in the cast is the letter carrier who you may recall has to deliver the mail to the folks around the pond by boat. He is Charlie (Phillipe McCanham) and they’ve all known one another for decades. In fact, Chelsea was the one he always had sought, but never won over. The plot involves Chelsea getting her dad to understand that she is grown up and she and Bill would share a room and a bed. And later when the couple takes off for Europe, something else comes about and the family is readjusted accordingly. This all volunteer theatre company does a wonderful job and delivers up one of the most pleasant couple of hours you could imagine. All without any politicians nor commercials. They’re located on Sandy Plains Road; easy to get to and free parking. More info at CenterStageNorth.com But, if you snooze you lose, only one week left.